This is a unique introduction to programming robots to execute tasks autonomously. 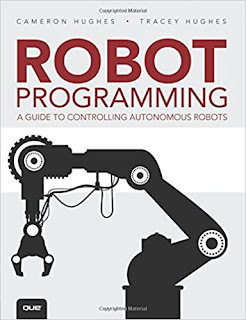 Drawing on years of experience in artificial intelligence and robot programming, Cameron and Tracey Hughes introduce the reader to basic concepts of programming robots to execute tasks without the use of remote controls. Describe the robot’s tasks and environments in a way that a robot can process using robot S.T.O.R.I.E.S. Program a robot to deal with the “unexpected” using robot S.P.A.C.E.S. Use robot programming techniques with LEGO® Mindstorms EV3, Arduino, and other ARM7 and ARM9-based robots.